Too much political power has been acquired by too few office holders. This trend must be reversed if we are to effectively protect our Liberty, prosperity and security. A larger and more dominant government behind closed doors, controlled by special interests, is not and cannot be a better government despite the steadily louder authoritarian drumbeat. Accordingly, representatives must be encouraged to act to reduce the power of those few and restore equal representation in this State. Legislation must vigorously defend our Constitution to insure the advancement of Liberty. In order to promote a more open and just government, the provisions of the Delaware Freedom of Information Act must be extended to include the General Assembly. Abuses of eminent domain must be constitutionally prohibited. Initiative - The right of citizens to propose legislation including constitutional amendments. Referendum - The right of citizens to ultimately vote on initiative legislation and constitutional amendments. Recall - The right of citizens to petition to dismiss elected officials for just cause. A process must be established whereby if the majority determines that they are no longer worthy of office removal will take place. Delaware's Family Court system must be made open, impartial and fair in full accordance with the Delaware Constitution. Current institutional deficiencies, abuses and inequities must be eliminated and the rights of children and families fully protected. Small and medium businesses and wage earners deserve the same tax breaks that the banks and large corporations now enjoy. The tax structure should be reformed to promote savings and investment. Government should first thoroughly re-evaluate its own operations and eliminate waste, incompetence and inefficiency before contemplating any tax increase, but sufficient money must be provided for essential government services. Corporate special interest groups have undue and inordinate influence and direction over legislation, public policy and administration. Contributions that corrupt the political process and operate to defeat the public interest must therefore, be prohibited. Sovereign citizens deserve an effective voice in the affairs of government at all levels. Delaware's education system at all levels needs to be thoroughly reorganized and redirected to enable all students to reach their maximum natural human potential. Accurately evaluating each individual’s learning rate and style rather than mass testing at grade levels should be used to help each child succeed. The careless drugging of students to keep them calm needs to be either evaluated or halted. Educational bureaucracy must be streamlined and held more accountable to the People. Critical educational policy decisions should be made at the school building level by an elected council of administrators, teachers and parents in a constitutional framework of checks and balances, serving to reassert local community control. Best available knowledge and methods must be implemented, academic and cultural standards raised, creativity encouraged and bureaucratic waste and inefficiency eliminated for the sake of our common destiny. The health care needs of all Delawareans must be adequately met through establishment of a universal comprehensive single-payer health care system emphasizing prevention and early detection. Consolidation and optimization of existing resources, bulk purchasing, streamlining of record keeping and elimination of waste, fraud and abuse will free private funding for business expansion economic development and individual discretion. Consumers, health professionals and relevant government agencies should be equally represented in an independent system dedicated to all citizens. The current maze of insurance company and HMO-controlled coverage schemes will implode as rates continue to soar to the point of unaffordability for most working and self-employed Delawareans. Establishment of a comprehensive health care system will attract new industries to Delaware. The People, on a nonpartisan basis, should elect Delaware's judges, at all levels. A state constitutional amendment is necessary to achieve this crucial reform. Delaware has failed miserably to protect the integrity of our air, soil, water and aquifers as our high environmentally related cancer and degenerative disease rates indicate. Our drinking water supply and public health are dangerously compromised by poor public policy. Delaware's environmental laws and public health standards must be strengthened and enforced effectively, fairly and impartially to protect people from harm when proven technology exists. Jobs and industrial development must be balanced against a verifiable sustainable quality of life. Delaware must thoroughly re-evaluate its current pollution control and environmental regulations to better protect the public and natural ecosystems. People at the local level should be given a much greater opportunity to actively participate in the environmental decision making process by enabling informal creative watershed-based sustainable solutions working groups, dedicated to solving real problems. All environmental regulations must be science-based and should foster economic efficiency and sustainability through ecologically based adaptive management. Public environmental monitoring should be upgraded. Citizens have a right to be warned of dangerous chemical releases. Citizens instead of polluting industries should ultimately determine environmental policy through establishment of an elected state environmental commission. In the face of a global population explosion and impending oil shortage, Delaware must actively investigate clean, sustainable and renewable energy sources by fostering a culture of invention and innovation, including solar, wind, biomass, hydrogen and tidal sources. Our homegrown solar cell industry should be facilitated as readily as new employers are. Clean self-generation of electricity should be encouraged to offset soaring utility rates. Public energy policy must be thoroughly restructured for the benefit of all Delawareans. In order to improve our roads and highways, we must first reform the DELDOT by rethinking management philosophy, operations, contract negotiations, planning, in-house capabilities, design standards and structural methods. Public input should be respected and not ignored. Delaware should actively explore innovative, integrated and sustainable mass transit options including continuing exploring high-speed rail lines. Delaware's long-term economic development should be based upon establishment of sustainable environmentally friendly businesses. Community development should be restrained within a comprehensive model, incorporating economic, environmental and quality-of-life factors. Active public participation in decision-making should benefit citizens. Delaware should close infrastructure gaps through a state-of-the-art planning and management approach. An accurate determination of carrying capacity should guide our County efforts with State assistance. We cannot plan for one area and ignore the domino effect on the others. Delaware must preserve its inherent ability to produce food, natural products, energy and forest products if our economy is to remain strong over the long term. In a competitive global environment of rapidly growing population, economic power will belong in large measure to food and energy producers. Policy must be directed to actively alter the economics of farming in favor of farmers through a coordinated program of research, crop diversification, technology assessment, innovation, product development and promotion of related food processing, agri-energy and support industries. History has shown that the bleak alternative will be a thoroughly overdeveloped suburban landscape with a low-paying service sector economy, higher taxes and lower quality-of-life when farming vanishes. The solution to many of our law enforcement and public safety problems is found in the Delaware Constitution. The independent elective office of County Sheriff, as Conservator of the Peace, was originally intended to protect our Liberty while providing cost-effective local community-based law enforcement. Accordingly, the Sheriff's Department should be revitalized and re-integrated into Delaware's law enforcement system. Proposed legislation that would remove this key check and balance by arbitrarily degrading the Sheriff's Office in any form must be staunchly opposed and their misguided sponsors should not be re-elected to the General Assembly. Delaware's emergency management capabilities need to be thoroughly upgraded. Greater public input to the process is sorely needed. The current mismanagement of Delaware's correctional system is a crime against all Delawareans. Delaware prisons must be adequately staffed to insure public safety within and without the system. The cost of our system must be weighed against the benefits if housing great number of non-violent offenders. Our correction officers deserve better pay and working conditions and a state government that will heed their constructive advice and act upon their legitimate concerns. 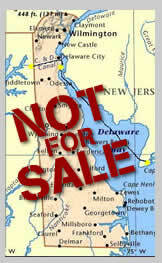 The People of Delaware will suffer in the end if self-serving politicians ignore them. The General Assembly must take effective action to correct long standing institutional and managerial deficiencies in the state prison system in the greater public interest. Special interest money corrupts elections and unduly influences pubic policy to the detriment of the public interest. The idea that money is the equivalent of free speech is utterly absurd and contrary to the founding basis of our republic. Public financing would impose reasonable limits on campaign spending and equalize the dollar per decibel ratio. This would greatly improve the campaign process and elevate the level of political discourse about real issues and ideas. Cleaning up Delaware's campaigns through elimination of character assassination and dirty tricks through appropriate legislation will attract a new generation of public interest candidates who would otherwise not run in the current muck and mire of status quo politics. The number of years that a public servant may serve in a given office should be limited to twelve, unless otherwise specified in the Delaware and the U.S. Constitution. The process of reapportionment at all levels should be open and accomplished through an independent citizen redistricting commission. Delaware has been ranked as the 13th most corrupt state in the union. This is a direct consequence of our weak public integrity code. We need a thorough revision of our ethics and public integrity code to eliminate conflicts of interest and other forms of corruption to restore our government to a higher standard. In order to accomplish this, we must elect the right people. The Independent Party of Delaware invites all prospective candidates of courage and vision to work for the greater good of Delaware by running on our ticket.